A total of 150 patients were enrolled for this study. The mean age of study participants was 30.5 ± 8.2 years, ranging from 17 to 76 years. About 20% (n = 31) of the participants were <25 years of age, 63% (n = 95) were from 25 to 44 years, and 16% (n = 24) were >45 years. Females (57.3%, n = 86) outnumbered male (42.7%, n = 64) participants. The majority (64.67%, n = 97) of the people were educated to 10th standard or below. 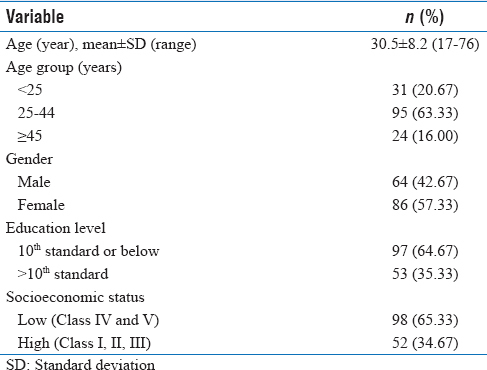 Nearly 65% of participants belonged to low socioeconomic status [Table 1]. Following reasons were elicited by study participants in response to a question on why you never donated blood. Top three barriers to blood donation were fear of needles (29.33%), too inconvenient (28.67%) and fear of collapse after donating blood (24.67%). 17.33% were of the view that they might contract the disease in the process of blood donation. 17.33% cited a reason for not donating blood as lack of time. Eight percent of participants had a fear of seeing blood. 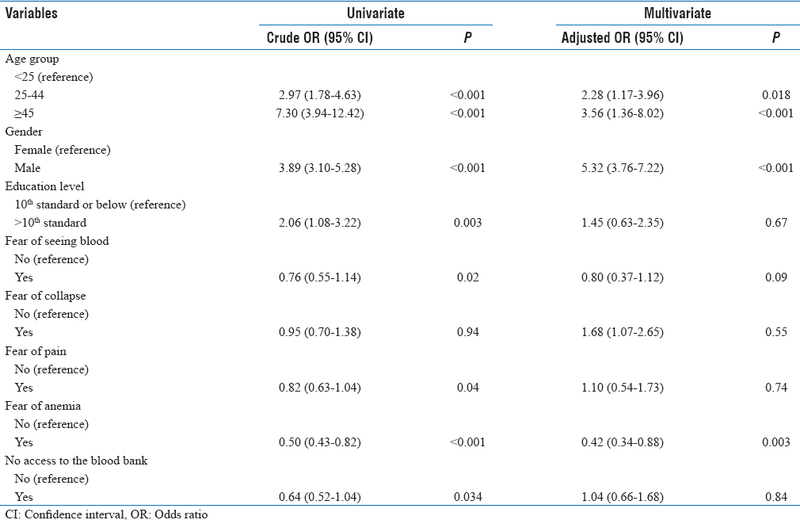 Five percent were of the view that blood donation reduces lifespan [Table 2]. To ascertain predictors of blood donation, the variables those were significant in the univariate model included male gender, age group 25–44 and older (P < 0.001), and education more than 10th standard (P < 0.001). Of the barriers, which negatively predicted blood donation were fear of pain (P = 0.04), fear of seeing blood (P = 0.02), fear of anemia (P < 0.001), and no access to the blood bank (P = 0.034). In multiple logistics regression model, the variables that remained significant after controlling for the confounders included male gender (P < 0.001), age group 25–44 (P = 0.018), age group 45 and older (P < 0.001), and fear of anemia (P = 0.003) [Table 3]. Singh P, Gupta RK, Shora TN, Langer B, Kumari R, Gupta R. Gender based knowledge, attitude and practice study about blood donation among medical students in a sub-Himalayan state. Int J Res Med Sci 2017;5:1882-7. Chopra D, Jauhari N. Knowledge attitude and practices towards voluntary blood donation among medical students in Barabanki. Ind J Community Health 2015;27:386-90. Bharucha ZS. Donor management in South East Asian region. Dev Biol (Basel) 2005;120:145-53. World Health Organization Towards 100% Voluntary Blood Donation: A Global Framework for Action; 2010. Available from: http://www.who.int/bloodsafety/publications/9789241599696/en/. [Last accessed on 2017 Sep 02]. World Health Organization Safety WB, Availability-Fact Sheet N 279; 2014. Available from: http://www.searo.who.int/thailand/factsheets/fs0029/en/. [Last accessed on 2017 Sep 02]. Dubey A, Sonker A, Chaurasia R, Chaudhary R. Knowledge, attitude and beliefs of people in North India regarding blood donation. Blood Transfus 2014;12 Suppl 1:s21-7. Abolfotouh MA, Al-Assiri MH, Al-Omani M, Al Johar A, Al Hakbani A, Alaskar AS, et al. Public awareness of blood donation in central Saudi Arabia. Int J Gen Med 2014;7:401-10. Mousavi F, Tavabi AA, Golestan B, Ammar-Saeedi E, Kashani H, Tabatabaei R, et al. Knowledge, attitude and practice towards blood donation in Iranian population. Transfus Med 2011;21:308-17. Melku M, Terefe B, Asrie F, Enawgaw B, Melak T, Tsegay YG, et al. Knowledge, attitude, and practice of adult population towards blood donation in Gondar Town, Northwest Ethiopia: A Community based cross-sectional study. J Blood Transfus 2016;2016:7949862. Alfouzan N. Knowledge, attitudes, and motivations towards blood donation among king Abdulaziz medical city population. Int J Family Med 2014;2014:539670. Singh AA, Kaur M, Singh A, Khan H, Goel S, Mengi A, et al. 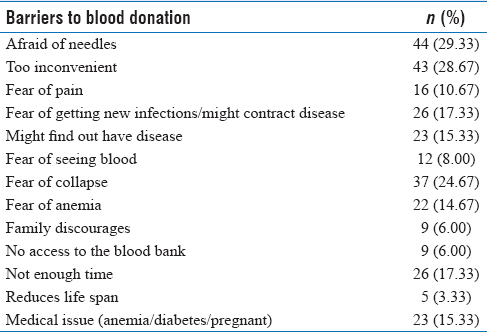 Rapid appraisal of factors impacting the blood donation process from rural Haryana. Indian J Sci Res 2015;6:87-90. Nwogoh B, Aigberadion U, Nwannadi A. Knowledge, attitude and practice of voluntary blood donation among healthcare worker at the university of Benin teaching hospital, Benin city, Nigeria. Blood Transfus 2013;797830:6. Meinia SK, Kumar Y, Meinia A, Singh G, Dutt N. A study to assess the knowledge, attitude, and practices about voluntary blood donation amongst the undergraduate medical students in Solan, North India. Int J Med Sci Public Health 2016;5:2550-4. Mulatu K, Hailu T, Yegezu A, Tena B. Assesment of knowledge, attitude and practice on blood donation in Aman sub city residents, South West, Ethiopia, 2015. Health Sci J 2017;11:1. Shaz BH, Demmons DG, Crittenden CP, Carnevale Cdents. Transfus Apher Sci 2009;41:191-7. Al-Haqqan T, Husain A, Al-Kandari N, Al-Rashidi L, Al-Daihani N, Mitra AK. A Cross-Sectional Study of Knowledge, Attitude, Practice, and Barriers Regarding Blood Donation among General Population in Kuwait. Int J Community Fam Med 2016;1:120. Available from: https://www.graphyonline.com/archives/archivedownload.php?pid=IJCFM-120. [Last accessed on 2018 Aug 25].